The L4B Amplifier metering functions were basically kept the same as the original design, but a few components needed to be moved around. The plate current meter function was left unchanged, but now that only one tube is being used the plate current meter calibration changed, so that needed to be recalibrated. The calibration control, white control just below the meters, has plenty of range so no component changes were needed. The power supply voltage metering required some component relocation since the high voltage divider resistor network was located down the left side of the plate tuning capacitor, which is now where the cooling fan is placed. The high voltage resistor divider network consists of four 10 meg-ohm resistors inside a plastic tube which runs parallel along the left side of the plate tuning capacitor. The final tube plate isolation choke was moved slightly back from the original position. That choke is now directly in line with a small 3/4" wide gap between the front edge of the high voltage transformer and the rear of the plate tuning capacitor and the rear side of the fan. The resistor divider network fits nicely down is this narrow space which can be seen in the second picture below. One end of the resistor divider network is soldered to the base of the plate choke to sample the plate voltage. The divider network slides down in that narrow open slot and is attached on the other end to a terminal strip just in front of the filament transformer. The wire from the low side of the resistor divider network goes under the chassis back to the meter function switch. The picture to the above left shows the resistor divider network soldered to the base of the plate choke. 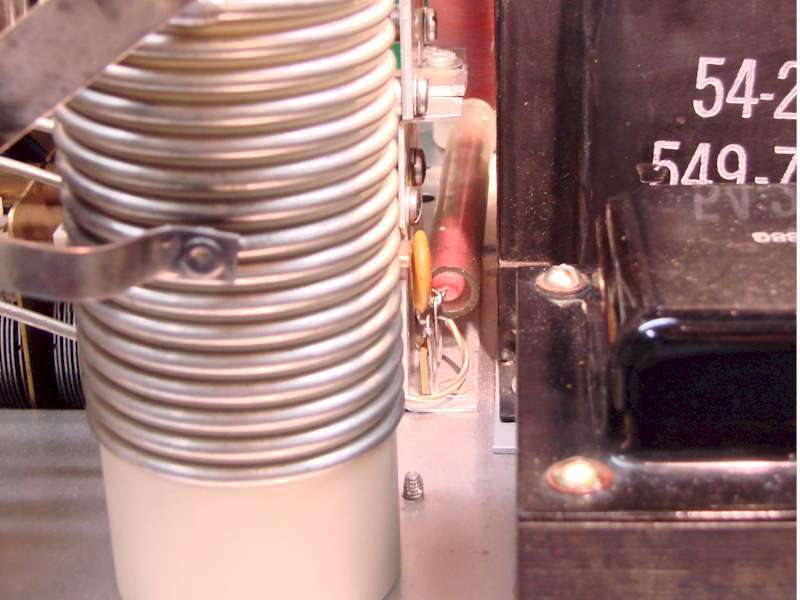 The picture on the right shows the resistor divider network placed between the high voltage and filament transformers and plate tuning capacitor and output loading coil. The other end of the resistor divider network is soldered to a terminal strip and held in place by both ends of the soldered connections. The clear plastic tube holding the resistor network is fairly thick and insulates the resistors so they can be placed close to the chassis and other components without fear of arcing. 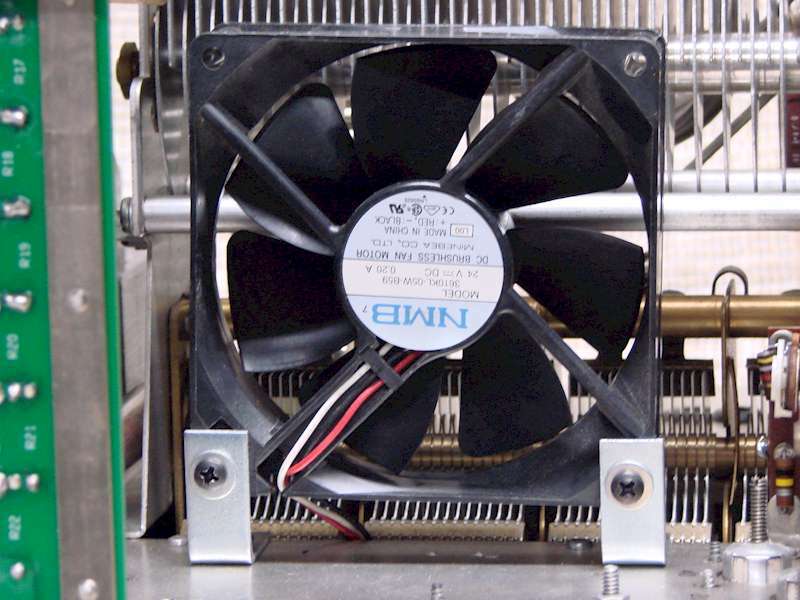 The original cooling fan design in the L4B was a 90 degree squirrel cage fan blowing air under the chassis through a channel and up through the tube sockets. The air pressure would blow up through the tube socket and around the tube and exit through the top of the chimney. This concept worked well for cooling but the blower was noisy and took up a large area of the chassis. For the redesigned L4B this blower was the first item to be removed in order to make room for the high voltage transformer. The redesign made the L4B a very compact with no room for that big blower. Also since there was only one tube in the amplifier less cooling would be needed. The direct air flow method of cooling seemed to be the most practical method. Since several other amplifiers such as the Collins 30L1 and the Heathkit SB-200 and SB-220 used the same type of cooling, this proved to be an acceptable cooling method. 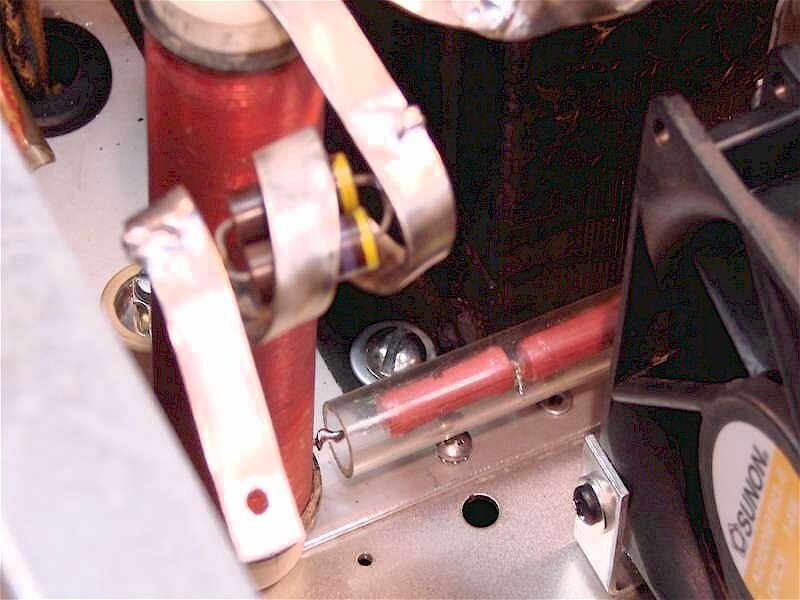 In the L4B redesign I found the open area between the final tube and the plate tuning capacitor was the best location for the fan. There was just enough room to locate a small 5 inch muffin fan with enough room on all sides so it would not interfere with the other components. Mounting the fan was accomplished with a one inch 90 degree bracket bolted to both sides of the fan and to the chassis. I choose a 12VDC fan which I wired to a 12 volt low voltage power supply under the chassis and wired in for continuous operation. The picture above right shows the fan assembly mounted to the chassis and to the right side of the final tube. 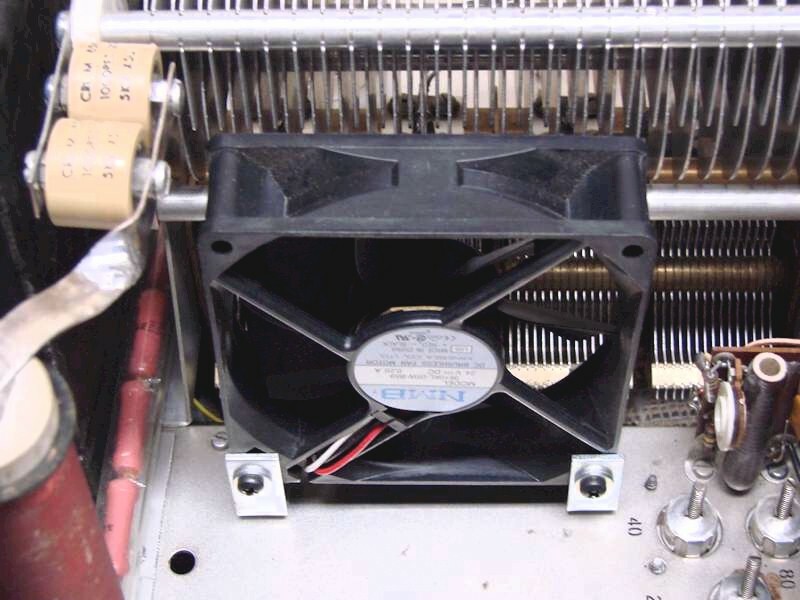 The fan blows across and around the tube and exhausts out the left side of the amplifier. The picture to the right is another view of the fan and how it was mounted to the chassis.